Don't let this little microbrewery fool you. The 3 Brewers or Les 3 Brasseurs is not the small pub out of Quebec that some who've visited its Montreal location may believe. It is in fact a chain from France, bringing the old European tradition of fresh non-pasteurized beers brewed on site to it's Yonge-Dundas location. The simple yet tasty menu includes brasserie fare and bistro dishes, culminating in their specialty flamms. The Flammequeches, flamms for short, are pizza-like Alsatian-style open faced pies with various toppings. Though calling them pizzas is like calling this French brasserie a British gastropub... same difference. What better way to start the evening than to have a pint of craft beer. We just missed the regular brewery tour that they offer, but maybe next time we'll catch the brewmaster in action. We had the Virago and the Amber Passion. The Virago's rich profile comes from a unique blend of malts, caramel, chocolate, and a hint of coffee. The Amber Passion is a vibrant and well balanced beer brewed with a special blend of pale malts. 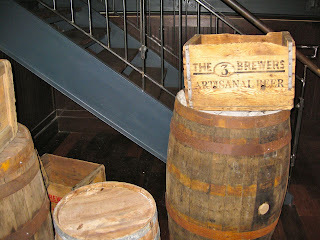 The beers were nice and fresh, full-bodied and very flavourful. They were a little flat for my liking though. Maybe I have grown too fond of megacorp Interbrew's Belgian offerings, as I expect the top of my tongue to be assaulted while the bitter flavours mellow in the back. As pub food goes, The 3 Brewers fills a unique niche in this city's foodscape. The flamms are simply delectable. We had the Smoked Meat flamm: smoked meat a l'ancienne, gruyere cheese and pickles. Though it was a little odd eating it with huge pickle wedges, the flamm was awesome. The smoked meat was definitely Montreal. I wished they put a lot more on. The gruyere was deeply fulfilling, and made us think that maybe other pizza places should really take a look at using this cheese. Yeah we know it's expensive -- if you build it, they will come. 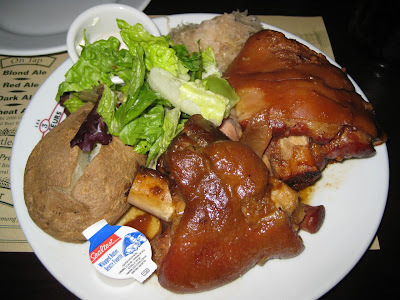 We also had the other house specialty, the Beer-braised pork shank, served with a salad, baked potato, and sauerkraut. This might need getting used to for some people, as pork hocks are not the most appealing sight. At first all you see is hairy, gelatinous skin, fat, and bone. I knew however that this was gonna be good. Filipinos have a similar dish called Paksiw na Pata, and my Eastern-Euro friends attest that pork hock is a beer garden staple. The staff advises newbies to flip the layer of fat and skin over to reach the juicy, succulent, flavour-soaked meat inside. The meat was great, but I also treated myself to bits of the skin and fat, eaten with the meat and sauerkraut. An acquired indulgence that some may be squeamish of. For dessert we had a flamm with apple and chocolate sauce. That was really good. 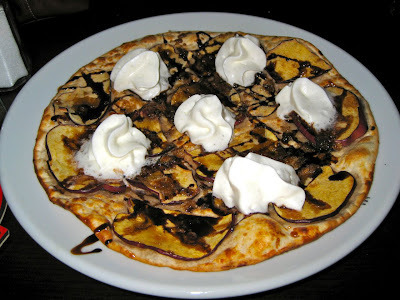 It was like a crispy, flaky crepe with crunchy slivers of apple, a rich chocolate sauce and dollops of whipped cream. The 3 Brewers is a delightfully casual place to have a beer and simple yet yummy food in a bustling touristy part of town. It's actually quite spacious inside despite the small street facade. I highly recommend the flamms. The wide variety of flamm toppings makes The 3 Brewers a definite food stop.